Whenever I’m idling somewhere I have a tendency of reading everything in sight. For instance, at the dentist’s office I like trying to anagram the words on the posters while I’m waiting. (Cancer: nothing. Medicine: I end mice! I am the mouse destroyer! Rawwwr!) 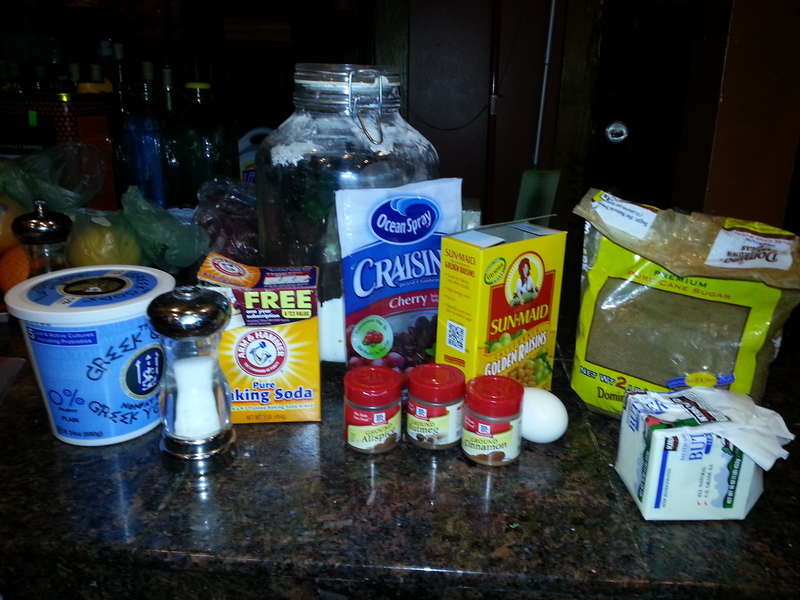 Anyway, I was eating oatmeal the other morning and noticed a recipe on the brown sugar bag, so thought I’d try it! Yum! There’s not too much to these delightfully fluffy, slightly spicy fruit cookies (it’s like light fruitcake in a cookie). I used greek yogurt instead of sour cream. I also use yogurt in place of mayonnaise (like egg salad etc. )- just add some lemon. Anyways, I thought I’d make a challenge to myself to wash as few dishes as possible: one bowl, one whisk, one measuring cup cookies. I ended up adding a measuring spoon too. I wonder if the author of Mme Bovary’s friends ever said things like “That’s so Flaubert.” (a la that’s so raven). And maybe they’d shorten it to “that’s so flau”. Or if there was something he’d really like more than the first thing, it’s ever more flau, or flau-er. Probs not cuz they were French and it was the 1800s. 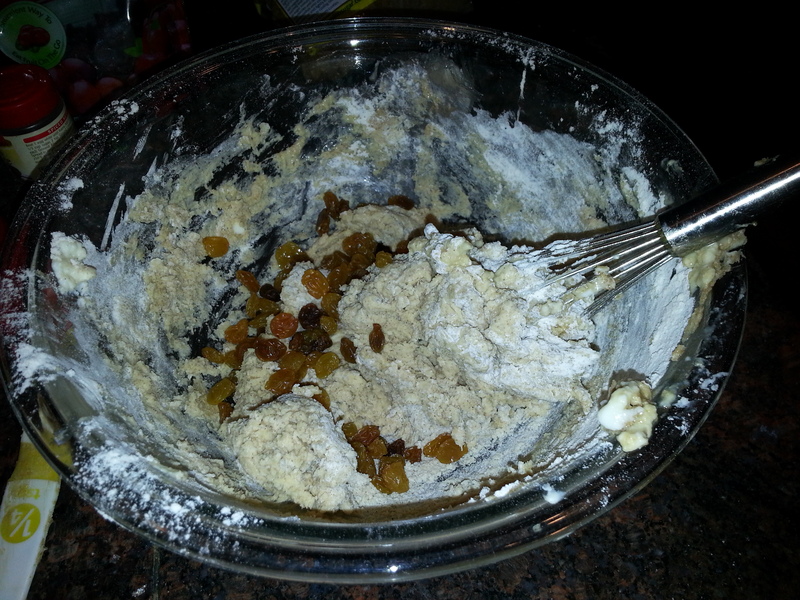 Usually I use two bowls: one for wet ingredients and another for dry, then mix them together. 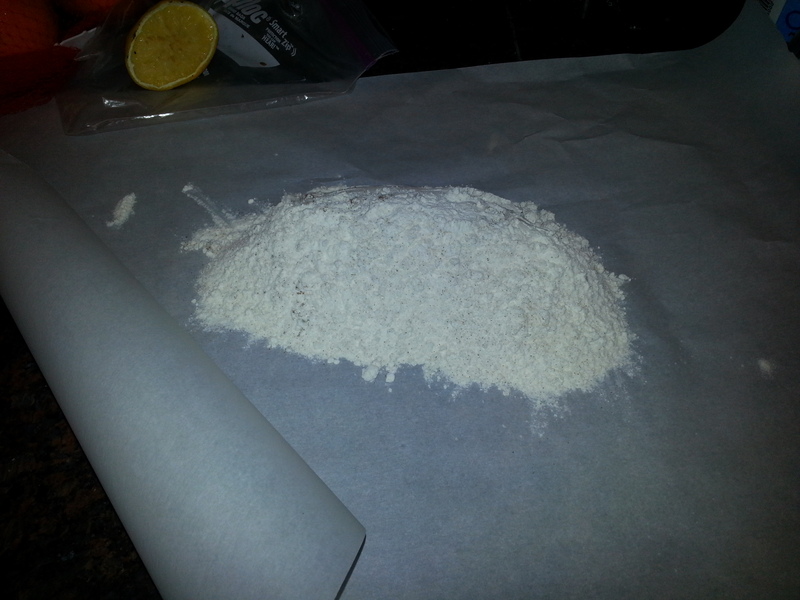 This time I whisked up the flour, baking soda, and spices in the bowl, and then dumped the blend onto some parchment paper (which I would later use to bake on, so I wouldn’t have to wash the cookie sheet). 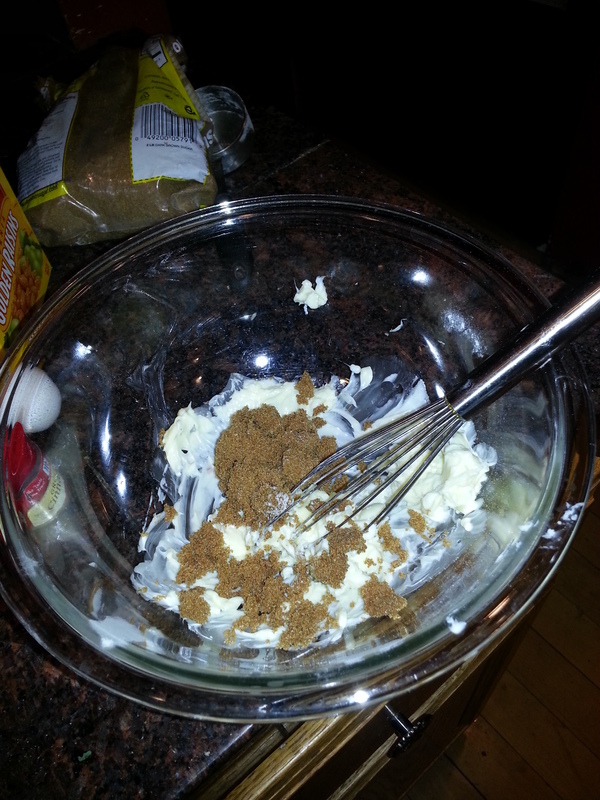 Next, as usual, you should cream your butter and sugar. Since this was on the brown sugar bag it called for only brown sugar, which was surprising but also great. Brown sugar has this beautiful depth to it which really works with the spices and fruits. There’s a reason sugar cookies are made with white sugar. 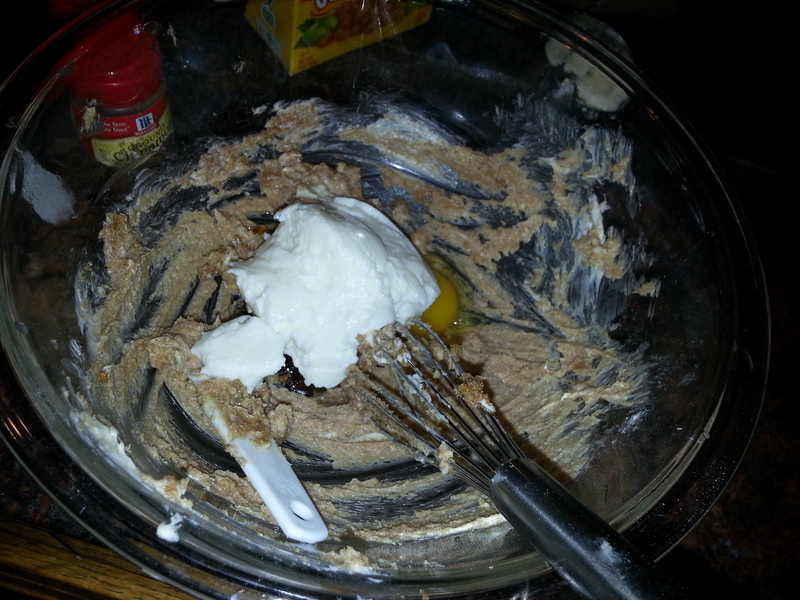 Next we finish off the wet ingredients with yogurt and an egg. Next time I’d probably also add a splash of vanilla. I couldn’t take a picture of me putting the flour into the wet ingredients because it used both hands, but be assured it was awesome. I just picked up the parchment paper and the flour easily slid right down the chute. So great! 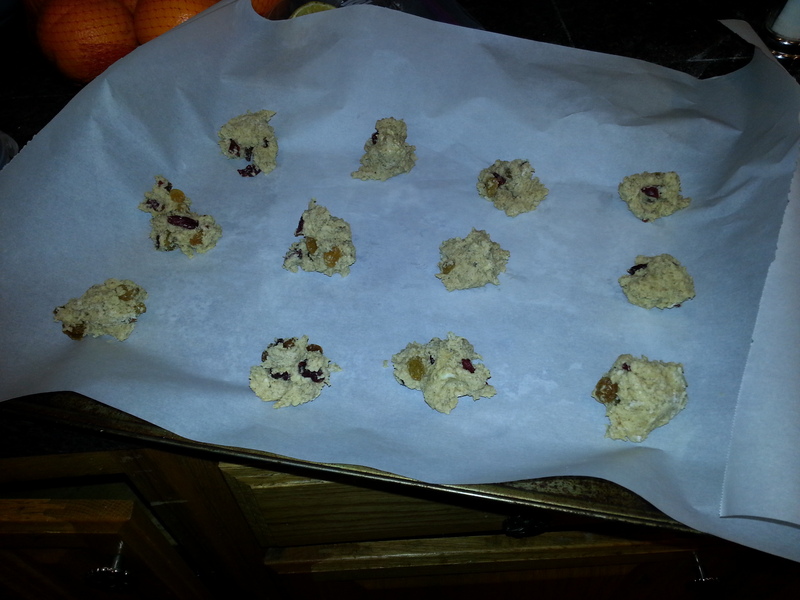 Finally you mix in a handful of golden raisins and a handful of dried cranberries. To make pretty cookies, the next step is key, which is why I didn’t do it. Use a tablespoon or even a tablespoon and a half measuring spoon to make perfectly round little mounds on your parchment paper. These cookies don’t spread very much so how you plop them is basically what you get. Drop it like it’s hot makes sense, but for cookie dough you more drop it like it’s lukewarm. Bake that for 8 minutes at 400 degrees. When these babies came out I thought they didn’t quite have enough flavor, so I heated up some leftover coffee until it was almost boiling (aka for 45 seconds in the microwave) and the stirred some chocolate chips into it. Do you want less cha? No, mocha! Then I drizzled this very beautifully over the cooling cookies while my lovely children played quietly in the garden with the buckets of 100-dollar bills we had won last week in the raffle. I’m just kidding, my kids would never play quietly. But I’m seriously kidding, I don’t have buckets of dollars. Or kids. Anyways. I threw the chocolate on the cookies. These were pretty good at first, but they were AWESOME after a few hours of sitting. 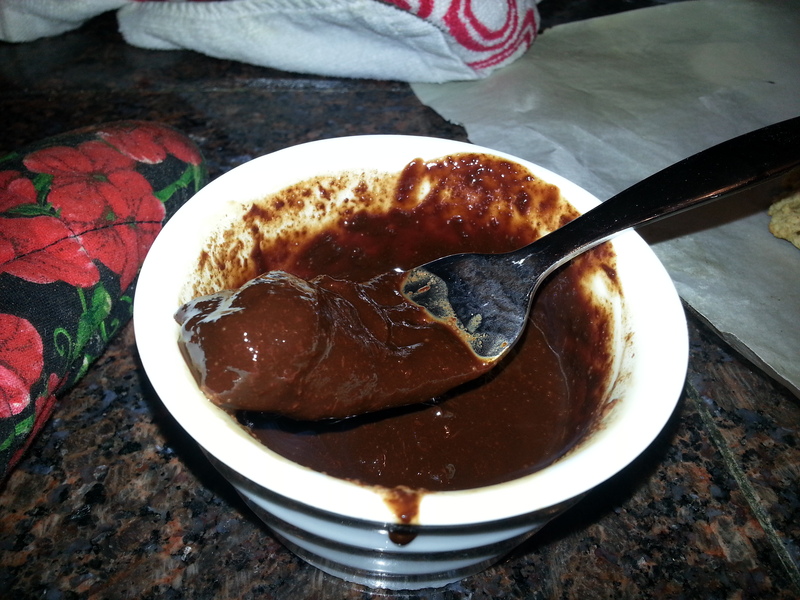 The sweet chocolate was a perfect offset to the warm spicy rich flavors with a curiously light and fluffy texture. Until the chocolate chips are melted and you have a good texture. 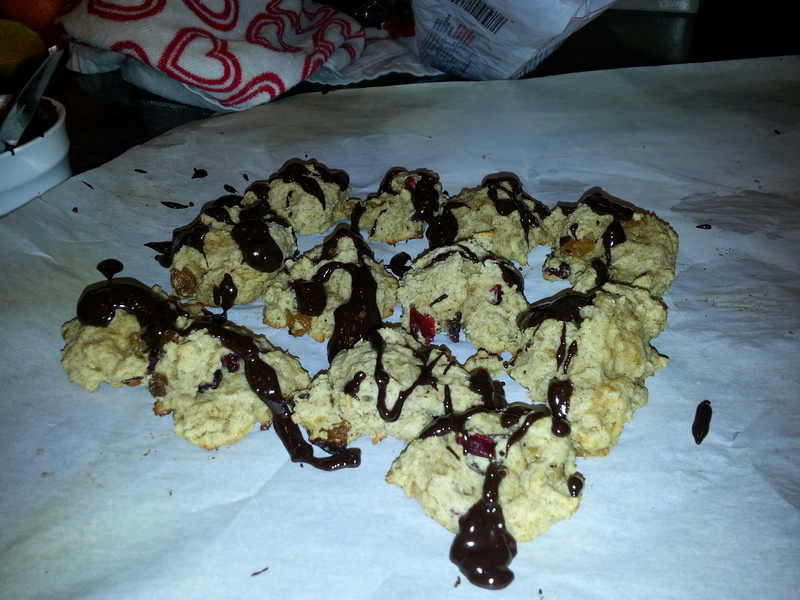 Then drizzle your melted chocolate-coffee beautifully over your cooling cookies (parchment paper is good for this). These are best after they’ve cooled, with a cup of tea.